Our comprehensive teaching programmes will give you all the tools and resources to teach French with confidence and motivate your nursery and primary school children to learn and love languages. Bring French to life with Camembear! Our 'Learning French with Camembear' programmes have been specially designed by qualified foreign language specialists; they are easy to deliver by teachers and nursery practitioners, even if they have no prior experience of teaching French, while also being stimulating and exciting for children. Camembear is a magical puppet who comes with his own "sac magique." The children wake him up by singing and ringing bells, then engage with him throughout the session. Fully adaptable for different groups of children and learning styles, our programmes can be used by both specialists and non specialists of French. The "Six Fun Steps to Success" give you a step by step methodology, making it easy to deliver and enhance your teaching across the curriculum. Learning languages at a young age helps children to develop cognitive and social skills, together with a sense of self-confidence that will carry them through into later stages of their education, and right into their adult life. Camembear inspires and motivates young children to speak with confidence in a foreign language. At Headstart Languages we know that the best way for language to be introduced is for it to be used little and often, as part of a familiar routine. That's why our programmes are designed to be delivered in-house, by practitioners and teachers that the young children know and are already at ease with. The Learning French with Camembear (LFWC) pack has been designed as a simple user-friendly programme - you don't need to be a specialist of French to deliver this. The structure is designed so staff can learn with the children. 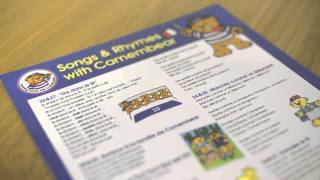 One member of the team will become the "Camembear Champion" who will organise the training of practitioners (a training DVD is supplied in the pack) and organise the delivery of French into the nursery planning. There is no need to bring in a French specialist to do the teaching as this can be done in house with the current practitioners and teachers. The programme encourages practitioners to bring the new language to life and make it meaningful by linking it to other areas of the curriculum. Camembear really motivates children to speak French as children are more confident speaking to a puppet in French and with practitioners they already know. LFWC is a very flexible, creative and enriching programme material. It is designed to complement what you already do in your setting. If doing numbers in English, why not reinforce numbers in French with Camembear? Learning French with Camembear is a fun, interactive and engaging programme designed to support learning across both the Early Years Foundation Stage and Key Stage 1 of the National Curriculum. It is a creative, enriching and flexible programme proven to give teachers and practitioners the confidence to deliver it with enthusiasm and to engage children. Camembear is also helping to prepare schools for a 1 + 2 Approach to Language Learning in Scotland. Our Learning French with Camembear1 resource aims to support primary school teachers and practitioners as they address the challenges of the Scottish Government's 1+2 Languages Initiative. In P1, modern language activities should be oral and aural based, supported by non-verbal language such as facial expressions, body language and gestures. Activities need to be engaging, motivating and purposeful. Learning French with Camembear 1 comprises a wide range of songs, games and stories which provide a strong linguistic basis for children's learning and enjoyment of a modern foreign language and encourages teachers to create bilingual environments through a variety of dual language labels, print and pictures. Teachers and learners will focus on developing the knowledge and understanding, skills, attributes and capabilities detailed in the Experiences and Outcomes. The Experiences and Outcomes in Modern Languages are organised within the same 3 components as Literacy, English and Gaelic. The 3 components are: listening and talking, reading, and writing. Although the focus from P1-P3 is on developing listening and talking skills, this will depend on the ability of the children and it is up to theteacher to use his/her professional judgement to determine when learners are ready to developtheir reading and writing skills in the target language. Information relating to the Experiences andOutcomes at First Level is suggested for each topic. It is important that you link planning to theExperiences and Outcomes to ensure there is progression. Many primary schools in Scotland are now using the "Learning French with Camembear programme" to complement and enhance the Curriculum Framework for language delivery in P1-P3. Start teaching French with Camembear, order your multimedia starter pack today!